July 2017 edit: I made this post in 2015 and I've learned a lot about grisette since then. I think this is a fine recipe for a good beer that is similar to grisette, but I think you could make a more 'grisette-y' grisette by following another recipe. For an updated and more grisette-like recipe, please see: What is Grisette part II. This is a follow up to my What is Grisette post with a recipe for a beer that I felt was a grisette. In June 2015 I gave a talk about saisons at a local brewery and I wanted to talk a bit about grisette (prompted by some of the same factors that influenced the first grisette post). And I felt that if I was going to make claims about what I thought grisette was, and that it was different than what people may have previously tasted, then I had better show up with what I thought grisette was. In order to be able to serve it, I brewed this as a 'pilot batch' for a local brewery. But my continued involvement with this brewery will be focused elsewhere and I don't intend this grisette to go into any sort of one-off, seasonal or normal production in Victoria. So I don't think it will be going anywhere commercially for now, but that's not a reflection of what I think about the recipe. I intend to keep brewing something like this on a regular basis at home. The second reason that this might not be a classic grisette recipe is the use of flaked oats. I have no reason to say that this was (or was not) employed in historic grisettes. But with such a low OG beer and highly attenuative yeast, I think it is a reasonable addition to build some body into the final beer while staying lighter with the grist. 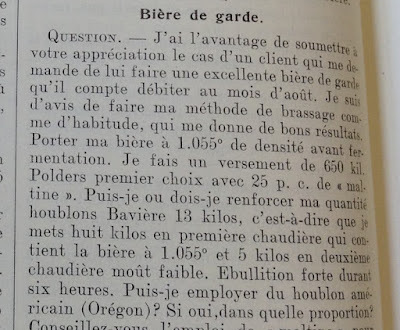 At a comparable time, wit beers would have been using oats (and to some grisette is described as a type of 'biere blanche', though that likely refers to the use of wheat and pale color rather than any other similarities to witbier) so it is not unheard of for Belgian brewers to be using oats at the time. And maybe oats made it into some grisettes, but I currently have no information to substantiate that so for now I'll treat the inclusion of oats as atypical. So I stand by calling this a grisette, at least based on the 1900's characteristics that formed the basis of my analysis in the "What is Grisette" post. Unfortunately I don't have any of this left, so I can't sit down and write up some notes. But I did drink a reasonable amount of it. At first (before packaging) I thought it was perhaps too hoppy, but in the end I really liked it. It was crisp, light (quite light actually, perhaps a bit too much so) and had a pleasant hoppyness and bitterness to it. At first I thought it was too bitter, but that passed and I was happy with the level of bitterness. The head retention and appearance were nice - lightly hazy but not obtrusively so. Definitely a beer I would happily drink a lot of. I'll have to re-brew this and come up with detailed notes to know exactly how I'd like to change it, but probably the only thing I'd do at this point is shoot for a touch more malt presence, perhaps by slightly increasing the vienna portion. Transferring wort into my primary fermenter. -I should note that this acidulated is for a minor pH adjustment and I think the recipe would probably work quite well (and possibly better) without it. A blend of Wyeast 3724 (Belgian Saison) and 3711 (French Saison), roughly 75%/25% respectively. Mash: One step at about 151-152 F (66.1-66.7 C) for an hour. This didn't really result in a higher FG than mashing for fermentability, and sort of backs up my experience with 3711. I've always equated this yeast to brett in some ways as I felt that it kept working on more dextrinous stuff, both in the carboy and in the bottle (even when bottling at/below 1.000). And while everybody mentions crazy attenuation with this yeast I hadn't heard much about continued slow attenuation of 'non-fermentable' material after reaching 'FG' until hearing a couple pro brewers talking about it recently. So, in the same way as I'd treat brett, I probably won't go back to mashing higher to try to decrease attenuation with 3711 in the future, and instead will come up with other ways to increase the malt character and body. This beer was fermented in a de-speared sanke keg. For this batch I just shoved a #11 bung into the top, but that forms a slightly imperfect seal (airlock still bubbles normally and I pressure racked out of it fine). So a bit more O2 may have gotten into the beer than ideal, but the beer was consumed pretty quickly and I didn't notice any issues from O2. It probably helped that I was using noble-type hops. I've since gathered the necessary supplies to adapt the de-speared keg and eliminate this potential for O2 pickup (a tri-clamp gasket that is flat on one side, a short tri-clamp stem and a clamp, see this Milk the Funk wiki page for some ideas). Because this beer fermented at the brewery instead of at my house in conditions that I know how to control well, the temperature regulation wasn't everything I would have hoped for. But overall it worked out pretty well. The yeast was pitched around 68 F (20 C) and the beer was allowed to free rise/was raised to about 78 F (25.6 C) by day 4. The temp was held in the high 70s (~25 C) for about 10 days or so, and then it dropped to ambient for about 3 weeks. It was then cold crashed for a couple days and bottled/kegged. I used this cane to bottle/keg it (at right), but in the future I'd probably use another racking cane (as described by this Milk The Funk thread, thanks to my friend Shawn for construction help) for that purpose due to the easier ability to adjust cane depth in the fermenter (especially since I could't see where the yeast cake was). How did this one turn out in the end? Do you have tasting notes? I'm formulating a Grisette for my next beer. I used Aurora in a Biere de Garde last March and was very pleased with the results. Brewing Belgian and French styles is becoming a Good Friday tradition! Thanks for the question and sorry it took me a bit to respond. Sounds like a good tradition and I hope your grisette brew goes well! I don't have a thorough rundown of my impressions on hand at the moment (and possibly not one at all). But I'll check and will update here if my books of brewing recipe have this. For now I'll say that I was quite pleased with the recipe. I think the bitterness might be a bit on the high end (especially given some recent sources I've found) but I like it here. I didn't dry hop this and I think that would generally be a good thing to do. I think the malt was right on. I'll also add that this past weekend I had the opportunity to taste a grisette brewed by two excellent brewers, including the person who probably knows the most about the style, and that beer was fairly similar to this one. Mine was a little more bitter and theirs was a bit stronger (they made a 'grisette de saison'-class grisette while this was intended to be lower strength), but malt character and general hop profile were very similar. They also used a bit of oats in that recipe, acknowledging that it may not have been the most traditional ingredient but they liked what it contributed. Thank you for getting back to me. Not brewed my own yet, but dialling the recipe in via research. Hopefully will have chance to brew this week. I'm considering dropping the bitterness to around 15-20IBU and dry hopping - Styrian Goldings and Tettnang being the hop choices, fermenting with French Saison yeast. Malt bill includes: Unmalted and malted wheat, oats and floor malted pilsner malt. If you are interested I'd be happy to post the dull recipe and get back to you with notes once completed? Grisette, frustratingly isn't a very well covered style in home-brew terms! Yeah, there is very little info out there about grisettes. I think this sounds like a good plan. I think dry hopping is good and those hop choices should work well. The French saison yeast is super easy to work with (as you likely know) and the body that the yeast contributes will help in something this low OG. From what I've seen, unmalted wheat wouldn't be traditional. But that doesn't mean adding it would be a bad idea. Just depends what you are going for. Cool, yeah. Feel free to post your insights here. Or if you'd prefer you can email them to me and discuss off of the blog, whatever you'd prefer. In looking back over this post, I retract the statement that I would up the vienna. I would still do that for other low strength beers which are similar, but probably not for this beer. At least in the next brew I plan to go without Vienna to see how I like it. And if I feel it should be included then I'll step it back up from there. Here is a facebook discussion mentioning some updates to my grisette research as well as a bit more thoughts on recipe. Thanks to all those involved in this discussion for prompting me to organize my subsequent grisette research a bit and to look back at this recipe. I'm planning to brew a Grisette, and I'm thinking of using the WLP566 Belgian Saison yeast. Would you say this would be a wise choice ? Any other alternative ? Thanks for following the blog and your kind words! Yeah, I think this yeast choice should work well for you. I don't have experience with that strain specifically, but I think using a saison yeast you like for a grisette is a good way to go. This is what I do when I brew them. Thanks for your question and sorry for my delay in getting back to you. I haven't used any Fermentis yeasts so I can't give you any direct advice, but looking over their strains it seems that T-58 would be a good starting place. I hope the brew goes well!